Aurora goes to show a 3 BR house for her Realtor mom. The handsome client finds the body of a Realtor in the backyard. Suspicion is aimed at all Realtors. Aurora starts investigating with help from her friends at Real Murders Club. Aurora buys a house where the previous tenants, the Julius family, disappeared 4 years ago - something that excites Aurora and her friends in Real Murders Club. They start investigating. Librarian and real crime buff Aurora Roe Teagarden never liked Detective Sergeant Jack Burns. She also never wanted to see him dead, but when he winds up murdered, she can't help but get involved. Aurora hosts Martin's niece and her newborn for the night, but then his niece disappears, the baby is found hidden in the bathtub and Aurora discovers a stranger in her linen closet, along with $10,000 cash in a diaper bag. Once again Hannah is plummeted into a murder mystery by finding the dead body of her competitor. But this time she's the one accused of murder over peach cobbler. Aurora! Obnoxious hyperactive and really annoying! 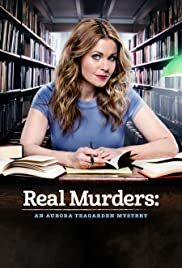 There wasn't much on TV so I gave Aurora Teagarden a go and couldn't believe how annoying the main character was! If you enjoy childish, simplistic women who act like 10 year olds, then this is the show for you! Aurora is suppose to be 28 years old, but it seems as if they are trying to appeal to young teens because any self respecting adult would find Aurora annoying as hell! I don't see the point in outlining the flaws and faults in the actual story line, which are too many to list, when the main character is so unbearable! For a mystery show, this one is full of insultingly stupid scenarios and murders, which I assume are aimed at simple children! I must say that there were a couple of actors that I do like normally, which was the only reason I gave the show a go, but to my dismay, even they were annoying! I am disappointed any self respecting actor would agree to be in such a stupid show! 17 of 45 people found this review helpful. Was this review helpful to you?